Many people learn they have periodontal (gum) disease after noticing gum swelling, soreness or bleeding. But what you can see or feel may be only the tip of the iceberg — the damage may extend much deeper. Gum disease is caused mainly by dental plaque, a thin film of bacteria and food particles built up on teeth due to ineffective brushing and flossing. Infection of the visible gums is only the beginning — left untreated, it can advance well below the gum line and even infect supporting bone. One critical concern in this regard is the areas where the roots of a tooth separate from each other, known as furcations. Here an infection known as a furcation invasion can cause the bone to weaken and dissolve. This usually occurs in stages (or classes) we can detect through manual probing and/or with x-rays. In the earliest stage, Class I, we might only notice a slight pocket in the gums with no significant bone loss. 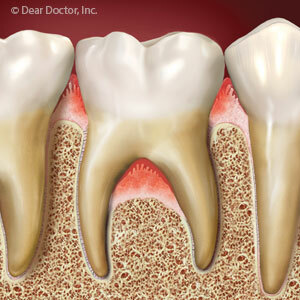 In Class II, though, the pocket between the roots has become a horizontal opening of two or more millimeters, indicating definite bone loss with increased pocket depth getting “under” the crown of the tooth. Class III, the last and most serious stage, describes an opening we can probe under the crown all the way to the other side of the tooth; the bone loss now extends “through and through” the furcation. The basic goal of gum disease treatment is to remove plaque and calculus (tartar) from all tooth and gum surfaces. But removing plaque below the gum line, especially “into” the furcations, can be challenging. We will need instruments called scalers to clean root surfaces, assisted sometimes by ultrasonic equipment to vibrate plaque loose. With furcations we may also need to employ surgery to aid gum or bone tissue regeneration or to make the area easier to access for future cleaning. Of course, the best way to protect against furcation invasions is to prevent gum disease in the first place. Be sure to brush and floss daily and visit us for thorough dental cleanings and checkups at least every six months. And don’t delay contacting us if you see any signs of teeth or gum problems. The sooner we can identify gum disease, the more likely we’ll be able to prevent it from doing serious damage to your gums, bone and teeth.